School is back in session and here at Google, we’ve been looking for ways to help you learn how to grow your business online. Many of you have been looking for one central place to go to get smart about online tools and strategies, and we hear you. That’s why we’re pleased to introduce Learn with Google, a new educational site designed to be a one-stop shop for businesses to learn about Google products and services like AdWords, Google Apps, Places, Analytics, and more. Whether you’re looking to grow your business or just be more productive, we hope that this collection of short videos, handouts, and resources will arm you with best practices and tips that you can use right away. Starting Your Business Online: Learn why having an online presence is critical for growing your business and how to create an online marketing plan. Discover how local marketing tactics can help you reach customers near you. Marketing Your Business Online: Master the basics of online marketing and AdWords to get more for your money. Learn how to choose the right keywords, write compelling ads, and optimize your advertising spend. Running Your Business Online: Learn how the Google Apps suite of online communications and productivity tools, like Gmail and Google Docs, can make your team more collaborative and your business more efficient. To get started, check out the videos, worksheets, and checklists at Learn with Google. From there, we’ll recommend other tips and how-to’s that will help you grow your business online. We’ll be adding more content and improving the site over time, so be sure to check back often. , a global university competition that affords students hands-on experience in online marketing. Each team of students partners with a small to medium size business or NGO and receives $200 to run a three week Google AdWords campaign. Ultimately, they submit their account and a campaign strategy report to an international judging panel of professors. Over the past four years, Challenge participation has soared. This year, 4,429 teams from 68 countries participated, representing an increase of 46 percent from last year and making the Challenge one of the world’s largest university competitions. Earlier this year, the Challenge was recognized for its educational impact by the American Marketing Association, which recognized the program with their Innovative Excellence in Marketing Education award. We’re proud to announce that the team from The University of Houston garnered the global award. Team members Erin Blatzer, Lauren Davis, Carolina Thomas, and Jeffrei Clifton, taught by Professor Steven Koch, shared the following thoughts on their campaign strategy for the Houston Symphony. For us, creating the right team -- including the right client -- was essential. The Houston Symphony gave us inside access to their marketing team and ongoing strategy, which formed the basis for our campaign's complementary strategy. The Symphony uses single ticket sales as an entry point for creating long term subscribers and donors...With 875% ROI, we knew we had delivered a strong campaign, and were delighted to share the insights generated with the Symphony team so that they could continue building revenue and community relationships online. To win the global competition on top of that is an extraordinary honor and we couldn't be more thrilled. In recognition of their success, the team and their professor are off to Mountain View, Calif. for a special tour of the Googleplex. To help in their ongoing studies, each team member will also receive an Apple MacBook Pro. We also extend congratulations to the four regional winners. For the Americas, the winner comes from James Madison University in the U.S., while a team from the Warsaw School of Economics won for Europe. The Asia/Pacific winner comes from Edith Cowan University in Australia and for the Middle East/Africa, the winning team comes from Bethlehem University in the West Bank. Here are more details about our winners. This year’s Challenge participants also competed for the NGO Impact Award, which recognizes online marketing campaigns that made an outstanding difference for an NGO. A panel of independent nonprofit leaders selected the winners based on short essays detailing the impact achieved by the nonprofit due to the AdWords campaign. The winning NGO partners will be awarded donations: $15,000 for first place, $10,000 for second place, and $5,000 for third place. We are thrilled to announce that a team from Vienna University of Economics and Business won first place for their promotion of Trash Design, while a team from Università Cattolica del Sacro Cuore took second place for their work with Instituto Oikos. The overall global winners from the University of Houston received third place for their impact on the Houston Symphony. For anyone interested in competing in the 2012 Challenge, formal registrations will open later this year and in the meantime, you can preregister. This year marks the fourth annual Google Online Marketing Challenge, a global university competition that affords students hands-on experience in online marketing. Each team of students partners with a small to medium size business or NGO and receives $200 to run a three week Google AdWords campaign. Ultimately, they submit their account and a campaign strategy report to an international judging panel of professors.
. If other colleagues at your organization use Google tools/products we'd also love to hear from them. Please refer them to this survey as well. As always, we appreciate your time & feedback. To remind you about some of the great resources available to nonprofits today, be sure to check out Google for Nonprofits video product tutorials & case studies on the our website. Additionally if you’d like to interact with other nonprofit users, head over to the Google for Nonprofits forum. And if you need additional help, there’s the Google for Nonprofits marketplace where you can find featured providers who can help you increase your impact online. The Google for Nonprofits team is constantly looking for new ways to provide the best tools & resources for our users. To that end, we’ve created a short survey to learn more about how you like to learn about Google tools for nonprofits. We’ll use your feedback to pilot some new educational initiatives designed to help nonprofit organizations be successful with Google tools. Please take 10-15 minutes to share your feedback with us in this survey. If other colleagues at your organization use Google tools/products we'd also love to hear from them. Please refer them to this survey as well. As always, we appreciate your time & feedback. This week we have news from the Gmail and Google Docs teams, which both made interface changes to streamline how you use those applications. We also introduced some new keyboard shortcuts and made improvements to spreadsheet charts and functions. The Gmail team has heard requests from many of you for an inbox preview pane, and last Thursday we introduced this option as a Gmail Lab. 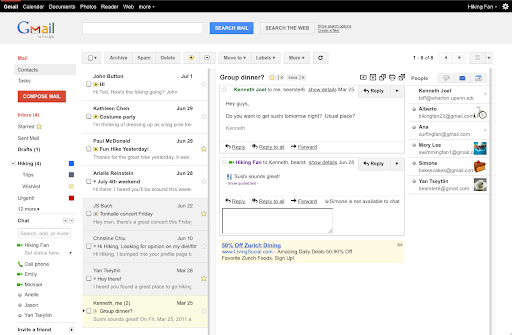 Now you can quickly scroll through a list of messages and see their contents, marking mail as “read” as you go. Once you enable this feature from the Labs area in Settings, you can choose between a vertical or horizontal split in your Gmail window. 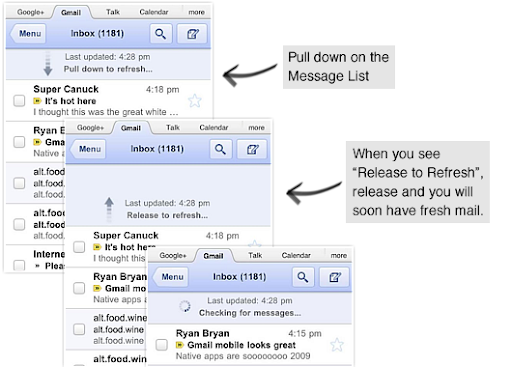 Last week we also brought a higher-resolution Gmail interface for people who access their inbox through a mobile browser on a high-resolution display, like the iPhone 4. We also simplified the process to check for new mail—just pull down on the Message List. Transitions between different pages in the interface are also smoothly animated now. Google Docs also got some big interface improvements to the documents list last week as part of a Google-wide project to streamline and simplify many of our applications. You can switch to the new design by clicking “Try the new look” under the gear icon in the upper right. We’ve also added dozens of new keyboard shortcuts to navigate through the documents list, create new files, share items and more. Just type ? to see the keyboard shortcut cheat sheet. There are spreadsheet functions you probably know by heart, and others like GoogleTranslate where you might need a tip now and again, so on Tuesday we introduced spreadsheet function snippets. When you start typing a function into a cell, we’ll instantly show you a list of matching functions. Hovering over a function displays its proper syntax and the function’s purpose. We hope this feature saves you trips to the Google Docs Help Center. 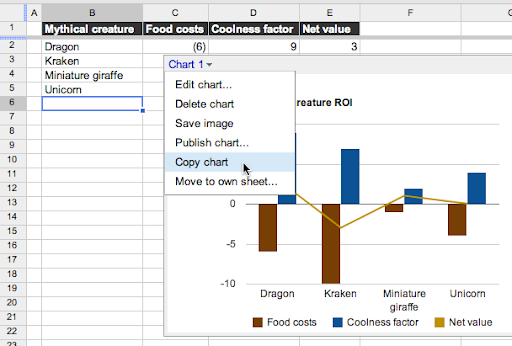 We also made spreadsheet charts more powerful and easier to work with. After you create a chart, it’s now simpler to copy an image of your chart and embed it into a document or drawing. There are more chart types to choose from now, too—from candlestick and combo charts to GeoMaps and TreeMaps. At the end of July, we opened our doors in Japan to more than 1,500 business technology leaders from the region for a lively discussion about the future of business technology. At the event, we heard from Softbank Group, Casio, Nortiz and Toda Corporation, who have all decided to switch to Google Apps from their legacy solutions. More than 60,000 other businesses around the world also switched to Google Apps since our last update here too, including Cox Schepp, Journal Communications, Crown Partners and ITV.